Our products and services are a trusted source for comprehensive industry news, project leads, and product sourcing information. 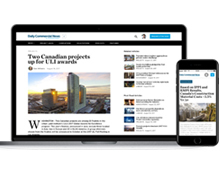 The authoritative voice of Canada’s construction industry for over 100 years, ConstructConnect is a trusted source for comprehensive industry news, project leads and product sourcing information. North America’s leading electronic plansroom with unparalleled search, spec share analysis and construction forecast capabilities in one great visual interface. Our project lead service for contractors boasts the strongest Canadian coverage, with time-saving search capabilities, including a proprietary trade search. Since 1927, the authoritative voice of Eastern Canada’s construction industry, delivering essential construction news, project leads, economic analysis, and certificates of substantial performance. 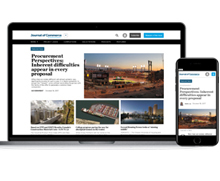 Western Canada’s most trusted industry resource, delivering essential construction news, analysis, tender information and legal ads to the marketplace since 1911. Canada's building design newsletter, the monthly DesignX curates top industry headlines, trends, projects and more to advance your architecture or engineering practice. Canada’s leading barometer of future economic activity within the construction sector, CanaData provides rich insights and analysis of industry trends to help guide your business. Have a specific market challenge you need to solve? Our specialized consultants are here to help!